This month, I am thinking about the ways I can bring ritual into my life more. Instead of new year’s resolutions, I am honoring the idea that ritual is important to me and inviting it into my life with awareness. 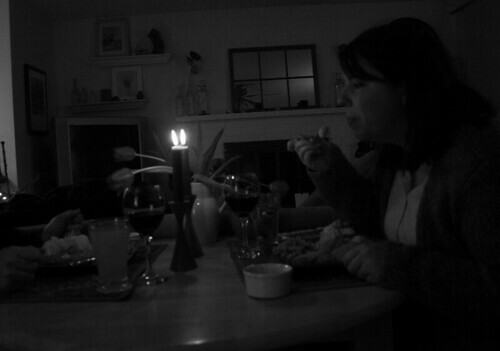 To turn off the day, the rest of the world, and just sit together and eat and talk and share. This is the hope I have for my husband and me. We have spiraled into the habit of sitting in front of the television and eating. When this happens, we don’t talk with one another…about our day…about our dreams…about our relationship. We don’t check in with each other. We just turn off the world by turning on the television. And yes, sometimes, to eat a pizza and watch a movie together on a Friday night is exactly what you need. But, to make dinner, set the table, light candles, pour wine, and sit down together…this is connection. To just move everything to the side and put down a plate and a glass of water and sit across from one another…this is connection. Tonight, as we sat together, I shared pieces of myself he didn’t know. I shared excitement about a conversation and some things I discovered as I reflected on that conversation. I spoke about some realizations and some memories. And he listened. We were both thankful for this time to just get to know one another more. It felt like exactly what we should be doing. No distractions. Just us. I want to do this with the meals I eat alone as well. I work from home, so I usually eat breakfast and lunch hunched over my laptop as I work. This means I often don’t eat what is good for me or what my body wants, but I instead eat what is easy and accessible. Last week, I tried to listen to what my body needed for lunch, but I still ate over my computer. I noticed a shift in energy, in a good way, when I filled my body with good stuff. This week, I am going to try to eat at the table, taking a break from my work. Sitting at the table. Noticing taste, texture, smells, colors. Paying attention. Being present to this necessary task. Being open to connection with another or connection with myself. Inviting awareness in once again. Inviting in the ritual of sitting at the table and eating.